Toei Animation and original author Akira Toriyama present the next chapter in the Dragon Ball universe with the first movie installment for Dragon Ball Super, which is Dragon Ball Super: Broly. 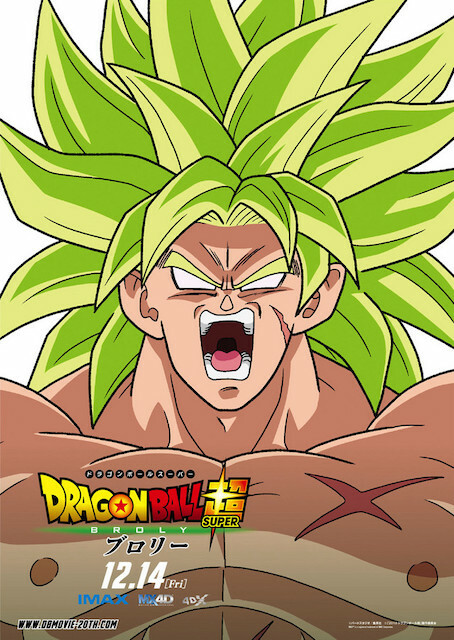 Broly has long been a mainstay character for the franchise and Dragon Ball media. However, the character has remained confined to the movies and video games. The new Broly film marks the first time a Dragon Ball story features the mighty Saiyan adversary that was conceived by Dragon Ball creator Akira Toriyama himself, and Dragon Ball Super: Broly does not disappoint. For fans who enjoy world-building elements, Broly offers them up in sublime fashion. The first half offers a more in-depth look at Frieza’s criminal empire, hierarchy of the Saiyans and planet Vegeta and the Saiyans’ roles as involuntary underlings to their tyrannical lord. The first half also serves as the new canonical backstory for Broly in the Dragon Ball Universe. That is unless Toriyama and Toei opt to adapt this storyline later in a television format similar to Battle of Gods and Resurrection ‘F’. The opening third of the narrative establishes Frieza as the new head of the Planet Trade Organization, taking over from his father King Cold, much to the chagrin of the Saiyan ruler King Vegeta. The proud Saiyan ruler is none too happy when he notices a commoner Saiyan child, an infant Broly, is placed in a type of stasis pod not far from his own son. Resentful of a mere peasant child having potential that matches and perhaps his own son, Vegeta has Broly’s pod banished to Vampa; a harsh desolate wasteland of a planet on the outskirts of the universe. Slighted by the move, Broly’s father, Colonel Paragus, steals a pod to fly to Vampa to locate his son. The group are eventually stranded on the hellish world, with Paragus vowing revenge against Vegeta and his line. The story picks some years later after the events of the Tournament of Power in Dragon Ball Super. King Vegeta’s son, the Saiyan prince Vegeta, and his wife Bulma are enjoying some time off on a private island. Of course, Goku is there as well so he and Vegeta can get in some light sparring. And the God of Destruction, Lord Beerus, and his caretaker, Whis, have also come along to relax and enjoy some fine cuisine. Obviously, it wouldn’t be much of a movie if there wasn’t a big fight. Eventually, Broly and Paragus are brought back into the fold and put on a collision course with Goku and Vegeta for an epic battle that’s the mother of all epic Dragon Ball battles. With the recent revival of the Dragon Ball franchise, the writing and character development has improved significantly. The Broly movie maintains this idea. Broly is given a much more in-depth characterization and backstory than previous adaptations. For the purposes of this story, Broly is much more than a mindless brute. He’s even given the opportunity to form a relationship and bonds with some new characters. As shown in the trailers, Goku’s parents, Bardock and Gine, also make appearances in the prologue flashbacks. Through Goku’s parents, there’s a much better sense of why Goku became the person he eventually did. The other great aspect of the flashback sequences is they offer an interesting space opera style. That style comes in through the fleshed out backstories for the Saiyan society and culture, as well as the minor underlings in the Planet Trade Organization. The story picks up once it moves to toward the inevitable battle between Goku and Vegeta against Broly. This fight in particular is probably the most extreme fight in the history of the franchise that’s ever been put to animation. Broly’s powers are on a comparatively different level than his Saiyan brethren, which is likely due to the harsh environment in where he grew up. Once again, it appears to be Japanese anime productions that are keeping the idea of traditionally animated features alive here. The characters and locations of the Dragon Ball series have never looked better. Though, there are a couple moments that look a little iffy, where the animators clearly use computer-generated character models for the fights. But overall, this is some of the best animation for a cinematic anime production that’s ever been put onscreen. The characters and movement all look really fluid and dynamic. Director Tatsuya Nagamine takes full advantage of a cinematic format for this universe. There’s multiple moments throughout the film that will please longtime fans of the franchise. In terms of writing, there are two new characters who form a bond with Broly: Cheelai and Lemo. Having Broly form a bond with other characters are fine, but Cheelai and Lemo at multiple points seem completely oblivious to the fact that their boss is Frieza and a genocidal tyrant. Additionally, there’s a couple awkward leaps in logic later in the second half, but that’s generally par for the course for the Dragon Ball series. One exceptional element about the writing is that Broly is a much more well-rounded character here. Additionally, voice actor Vic Mignogna, who has been the English voice for the character across all the previous movies and games, now gets the chance to play a more three-dimensional version of Broly. Throughout the movie, Toriyama does a good job in showcasing how far certain characters have evolved over time and how far they’ve come. Even Frieza, while not having necessarily grown as a person, has changed his perspective by a few degrees. One of those is actually quite amusing. The cast and focus are kept fairly tight for Dragon Ball Super: Broly. Not too many other characters show up. Piccolo’s role is kept fairly small. Krillin, Gohan and co. are kept offscreen. In exchange, more time and focus is given to the Saiyan battle royale in the second half. Dragon Ball Super: Broly is symbolic of how far the franchise has come and how it continues to deliver great stories under Akira Toriyama’s supervision, with topnotch animation to boot. Dragon Ball Super: Broly delivers a fan-pleasing, epic action clash that will satisfy longtime fans of the franchise and also delivers some fantastic feature animation. This is the classic, iconic characters of the Dragon Ball Universe like they've never been seen before. Creator Akira Toriyama provides a nice, fleshed out backstory for Broly that also serves in providing some great depth and overall texture to the Dragon Ball mythology. This is the long awaited return fans have wanted to see for Broly for years.